Lyle's is chef James Lowe's much anticipated solo-restaurant, located on the ground floor of the Tea Building in Shoreditch. The Tea building was originally built as a warehouse and distribution centre for the Lipton Tea Company, but is now home to shops, galleries, offices and Shoreditch House, a boutique hotel which occupies the top three floors of the building. And Lyle's of course. James Lowe has trained in the kitchens of Heston Blumenthal's The Fat Duck in Bray and Michelin-starred La Trompette in Chiswick, but he is best known as the former head chef of Fergus Henderson's St John Bread & Wine in London, and as co-founder of the The Young Turks chef collective/movement, other members being Ben Greene (now head chef at Momofuku Seiobo in Sydney) and Isaac McHale (now head chef at The Clove Club in London). Lyle's is open for breakfast, lunch and dinner from Monday till Friday. On Saturdays the restaurant only serves dinner. At lunchtime there's an a la carte menu with dishes ranging from £5 to £8 and in the evenings the restaurant offers a set menu (5 courses + appetisers, £39). I had dinner with my husband at Lyle's on Saturday 28 June 2014. First to arrive were three appetisers. 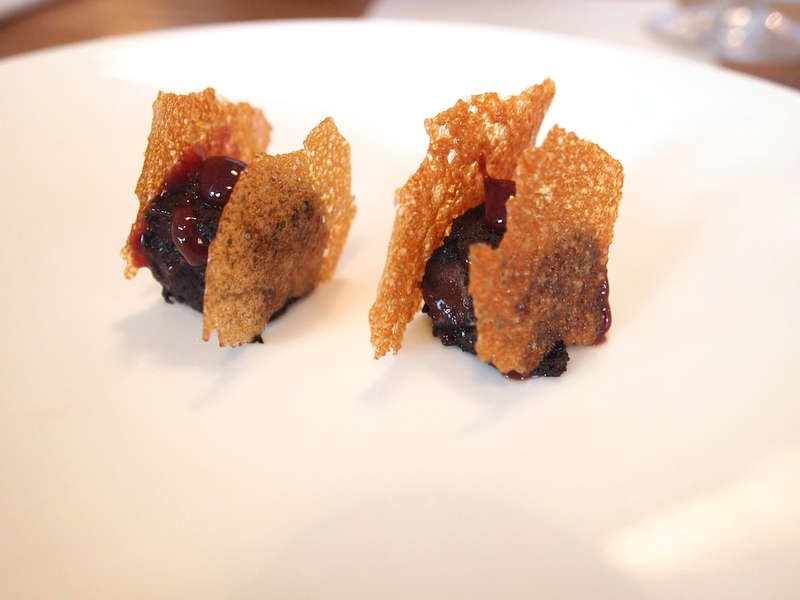 Soft and moist bloodcake with damsons, sandwiched between two crisps mad from dehydrated potato. The bloodcake had been seasoned with warm spices and the damsons delivered a nice touch of tanginess. 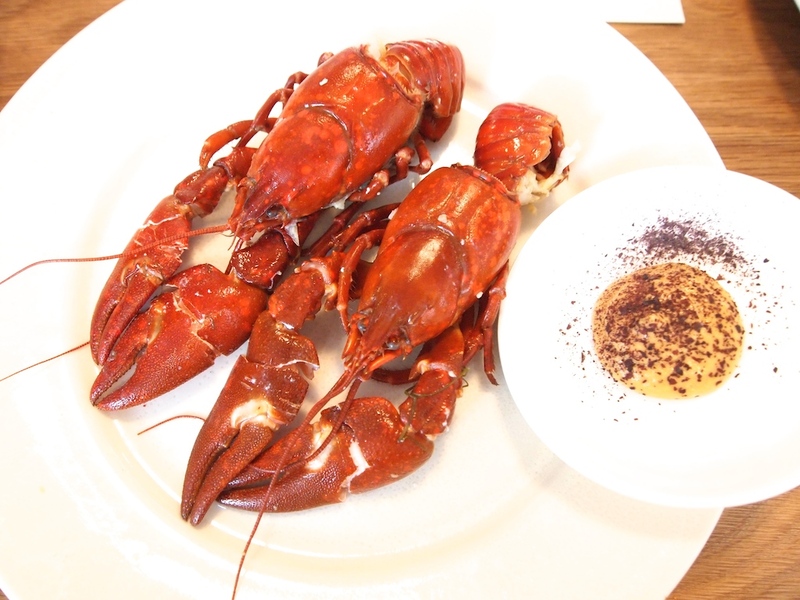 Then there were cooked whole crayfish served with a creamy crayfish and dulse mayonnaise, followed by buttered Norfolk samphire that had been steamed for 90 seconds. First course of the menu was Peas & Ticklemore. 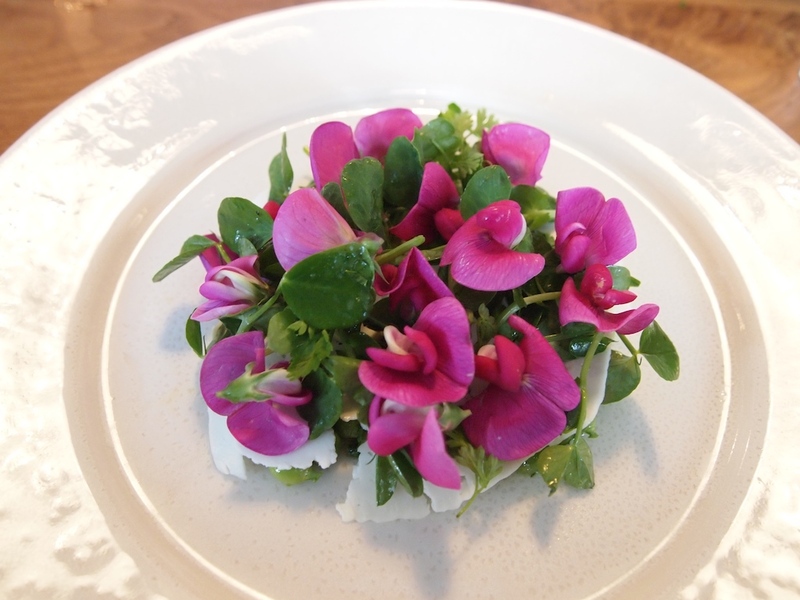 A salad of fresh peas, shavings of Ticklemore goat's cheese, chervil, pea shoots, mint, apple vinegar and garnished with bright and pink pea flowers. A lovely salad with balanced, pure flavours, the goat's cheese adding just the right touch of luxury. 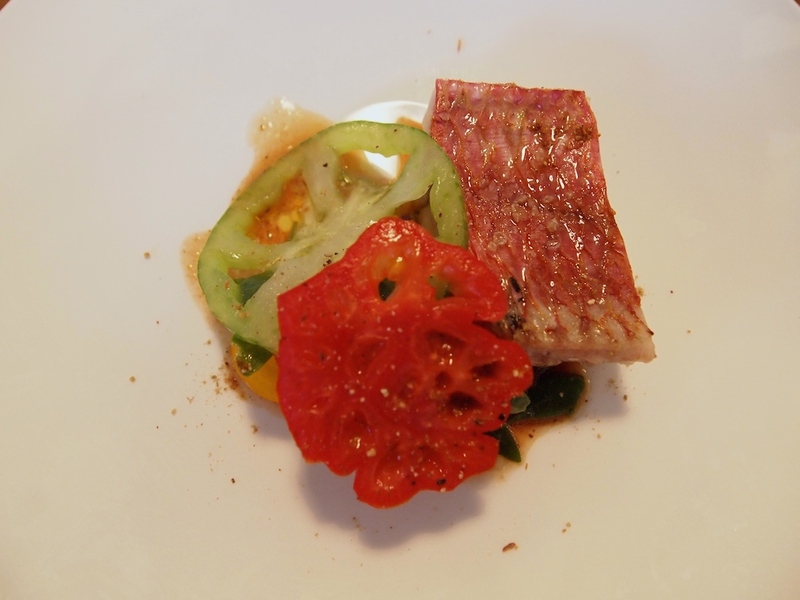 Less convincing was the next course: Red Mullet & Tomatoes. Well-cooked red mullet, seasoned with fennel salt and served with sea purslane, a concentrated thick tomato sauce/puree and fresh tomatoes. I liked the red mullet and tomato flavour combination, but the concentrated tomato sauce had an unpleasant (metallic?) finish. However, the next dish, Dexter Rump Cap & Onion, more than made up for that. 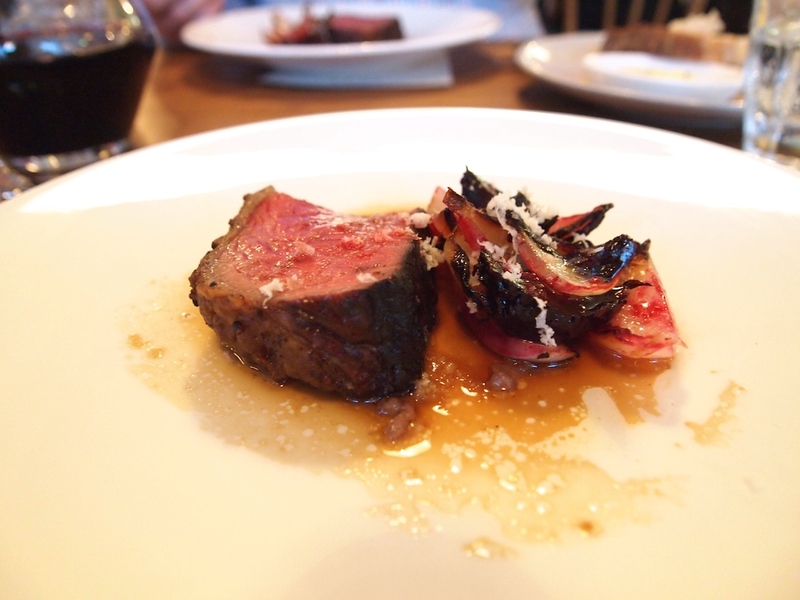 An excellent piece of beef (aged for 8 weeks) with robust beef flavours and a nice chewy texture, successfully paired with roasted onions, beetroot, an onion and beef fat jus and a sprinkling of freshly grated horseradish. Fourth course was Cheese on Toast. Buttered sourdough with a thick slice of Cardo goat's cheese (a semi-soft goat's cheese from Somerset), London honey, a few drops of vinegar and grated toasted hazelnuts. An absolutely wonderful combination of texture and flavour and the London honey was a nice touch. Last and fifth course (no photograph) was a delightful dessert of juicy, macerated Kentish loganberries (a cross between raspberries and blackberries), loganberry jelly and granita, vanilla ice cream and rose vinegar meringue shards. Nice texture and sweet vinegary flavours from the meringue shards; the loganberry granita brought a nice freshness to this well-balanced dish, that displayed an original choice of ingredients. On this Saturday evening James Lowe had put together an attractive menu. 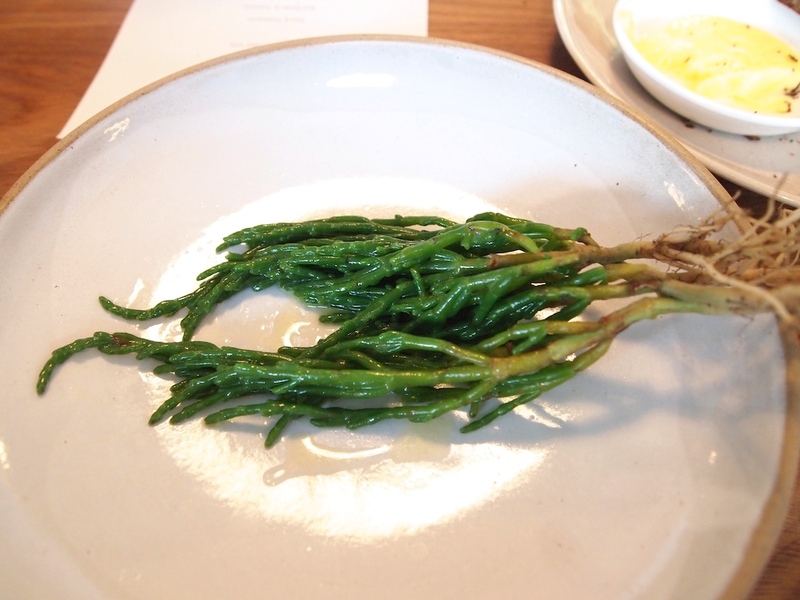 I liked the simplicity of the dishes and the choice of ingredients and the presentation were off the beaten 'slate'. 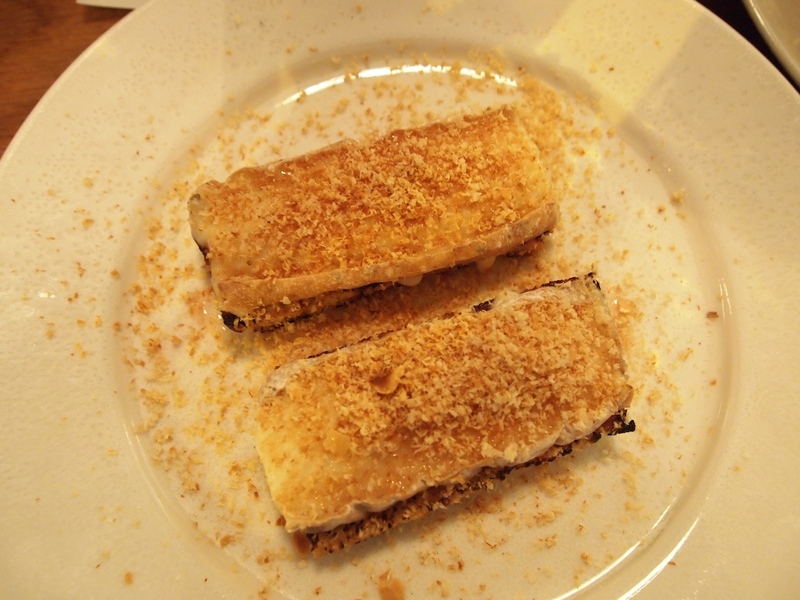 Lyle's serves resourceful and interesting food, prepared with carefully sourced ingredients. Service was smiley and efficient. The concise wine list offered interesting choices; the Jacquesson Cuvée 737 is a must for every Champagne lover and when you're there, do not miss out on Guimaro's rare Finca Meixeman 2010 from Ribeira Sacra.I will certainly be back.